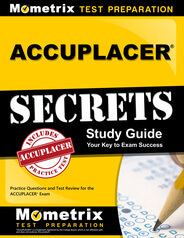 Many students will be required to take the Next-Generation ACCUPLACER test early in their college career. In some cases, students even take it in their last year of high school before they begin college. This is a placement test that measures the core skills needed for success both in academics and your career after college. What Is the Next-Generation ACCUPLACER Test For? The Next-Generation ACCUPLACER exam is a college preparedness test that measures a student’s skills in reading, writing, and math. While something like the SAT or ACT is used to qualify you for admission into a university, the Next-Generation ACCUPLACER test is about precisely placing you at the correct level of introductory classes. It doesn’t measure your potential like the SAT or ACT, it diagnosis your precise skill level. Over the course of your college career, you need to meet certain general education requirements so that everyone, no matter which subject they major in, has at least the same basic level of command of the core skills people need, regardless of their career path. For example, if you do very well on the reading and writing sections but not as well in math you would be placed in a higher level introductory language arts class but a more rudimentary level math class. This means you would be able to complete your language arts requirements sooner because you would be able to skip over some of the lower level classes. Meanwhile, you would have to take more math classes because you are starting at a lower point. So the better you do on this test, the more introductory classes you’ll be able to skip over so while it’s not strictly necessary to study for this test, doing so could mean the difference between taking just one math class and taking two or three math classes. What Is on the Next-Generation ACCUPLACER Exam? In addition, some schools or programs will require that you take additional skills test such as essay writing, computer skills, or other specialized exams. You can talk with your college advisor to find out exactly which sections you will need to prepare for. All of the sections (except for the written essay) are multiple choice and usually contain about 20 to 25 questions. For the math portion, there will be approximately 20 to 25 questions per section. The Next-Generation ACCUPLACER test is not timed so you can technically take as much time as you need to complete each section. Given that you cannot use a calculator for most of the test, this is an advantage you can definitely take advantage of. Don’t feel rushed to answer questions quickly in order to finish the test sooner. You don’t get extra points for finishing quickly. Take your time. Double check all of your work to make sure you didn’t make any errors in your calculations. Read the passages in the reading comprehensions section slowly and absorb each word. Remember that these are just rough estimates to help you plan your day. Your actual time may be much lower or much higher and there’s absolutely nothing wrong with that. Given that time is not an issue, the most important thing is to focus on getting as many correct answers as you can. If you would like a more accurate measure of how long the test is going to take for you, make a habit of timing yourself during any practice tests you take in preparation for the exam. To improve the accuracy of this time, try to recreate the testing environment as best you can during practice tests. Sit at a desk in a quiet room, with your phone turned off or silenced, make sure the only material you have with you are those which you will be able to bring with you on test day. The test is free to students and provided by your college or university (or high school if you are taking it earlier). If you would like to retake the test, however, some colleges will charge a fee for each additional attempt. However, you don’t really need to retake it unless you didn’t meet your school’s cutoff scores or you feel you really didn’t perform as well as you could have. If you do feel that you could have done a lot better, make sure you give yourself enough time before your next attempt to review the material that you didn’t perform well on in the first attempt. What Is the Highest Score You Can Get on the Next-Generation ACCUPLACER? Each multiple choice section of the Next-Generation ACCUPLACER test is scored on a scale of 20 to 120 while the essay is scored on a scale of 0 to 8. Your score is determined using an adaptive test method. This means that each question you answer determines the difficulty of the next question you see. If you answer correctly, the next question will be harder. If you answer incorrectly, the next question will be easier. The score you get refers to the average level of difficulty of the questions you answered, regardless of whether or not you answered them correctly. However, the more correct answers you provide, the more difficult your questions become and the higher your average difficulty (your score) will be. While this is not a pass/fail type of exam, some colleges do have a cut off score and even if they do not, it is still important to do as well as you can on the test because, as mentioned earlier, the better you do, the fewer introductory classes you’ll have to take. Do I Need to Study for the Next-Generation ACCUPLACER? You definitely should study for this test, especially if your college has a cutoff score. Moreover, even if you feel confident that you could do well, studying allows you to refresh your memory and call all of that relevant knowledge to the front so that you will easily remember what you need to do to answer each question correctly. Since this exam is so comprehensive, it’s likely that there will be some material that you definitely need to review. You have your own particular set of strengths and weaknesses so you may be able to ace the arithmetic section without any additional effort but the advanced algebra section could leave you stumped. With that in mind, the best way to prepare for this test is to review every section of the exam, including your strengths. Then, give yourself additional time to prepare for the portions that you need more work on. A great study aid to use is the Mometrix study guide. The guide contains a complete overview for each section of the exam including a review of English grammar, punctuation, and conventions as well as clear and easy to understand explanations of all the different types of math problems you will encounter in the math sections. It even provides practice reading passages and tips for improving your reading comprehension skills. 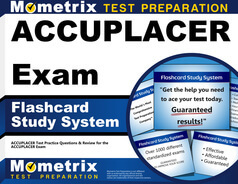 Another great study aid you can use for the Next-Generation ACCUPLACER test are the Mometrix flashcards. These flashcards are an extremely effective way to absorb the material you need to learn. It’s a very convenient way to quiz yourself or have a friend quiz you. Plus, you can easily take them with you so that you can pull them out for a quick study session whenever you have a few spare minutes. Both the study guide and the flashcards include practice questions so that you can familiarize yourself with the different kinds of questions you will see on the test. These are definitely two of the best tools to help you perform your very best on test day.